Gabby Adams (12th Grader) at Carrboro High School and John Hite (teacher at Carrboro High School). We are planning a Silent Auction at Carrboro High School to support a water project in Kampala, Uganda. We are looking for things to auction off . . . specifically things like: home goods, paintings, sporting tickets, beach homes for a week or weekend, gift cards/certificates, babysitting services or anything you have that you no longer have a purpose for, objects that are new or gently used. Butambala is a district west of Kampala, Uganda (shaded in red below) which has a population of about 105,000 people. 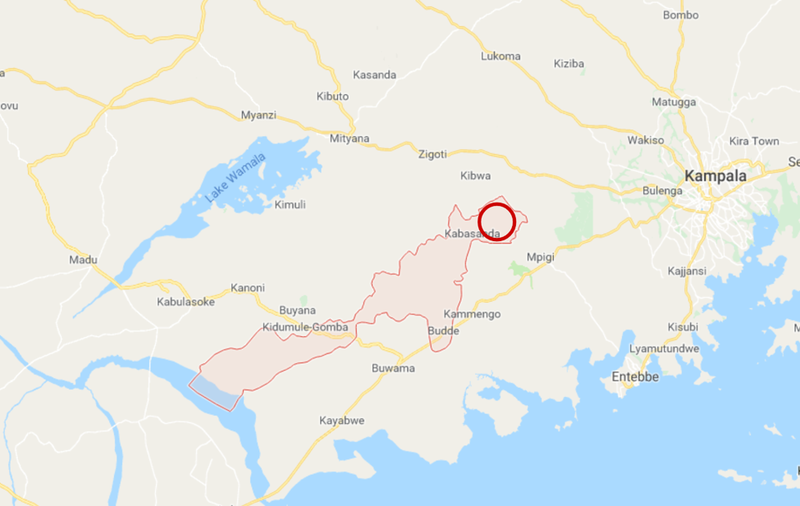 This project will be specifically focused on the Kitimba region of this district (circled below). This project will serve Kitimba Primary School (320 students) and Kitimba Health Centre which serves 8,000 residents in the immediate area, and an additional 8,000 residents in neighboring villages. The Health Centre treats about 50 patients per day and has about 5 labors per day. The most common diseases they treat for are typhoid (from contaminated water) and malaria. Currently, the closest water supply to this area is a spring 1.1 km away. Children often fetch water before and after school for use throughout the day. If funding is available, the school will provide bottled water for the students, but this is often very expensive, costing around $27 per day (for reference, a Dasani-sized 16.9 oz bottle of water costs around $0.17). The most common water sources in this area are rain harvesting tanks, shallow wells or springs, and purified water from the market. The existing rain harvesting tanks don't hold enough water for the entire year. Available tanks are not big enough, and larger tanks are very expensive and difficult to transport to the village. There are also two very dry seasons which total around 6-7 months of the year. Buying purified water from a local market is very expensive. They either buy bottles of water or tanks of water which is shipped in from out of town. Many times they can't afford the water or there isn't enough water available at the market. 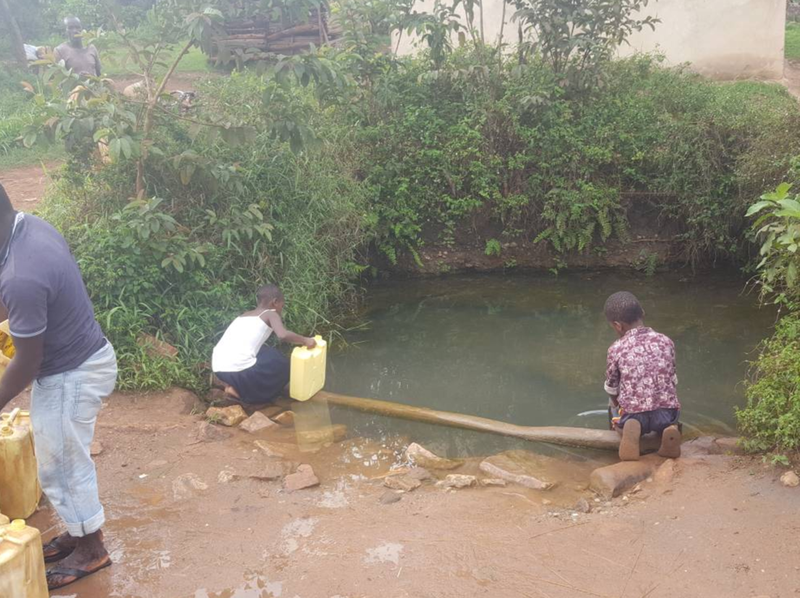 We saw quite a few pre-existing wells in the area, but many were not functioning. The causes of which were due to poor construction (many were hand dug and didn't reach very deep into the water table) or poor maintenance (many used manual pumps, and pumped the well dry by collapsing underground aquifers). A rough sketch of the system we plan on implementing is shown below. We will drill a borehole with a solar-powered submersible pump in the center of Kitimba Village. The pump will run throughout the day to pull water into a holding tank. 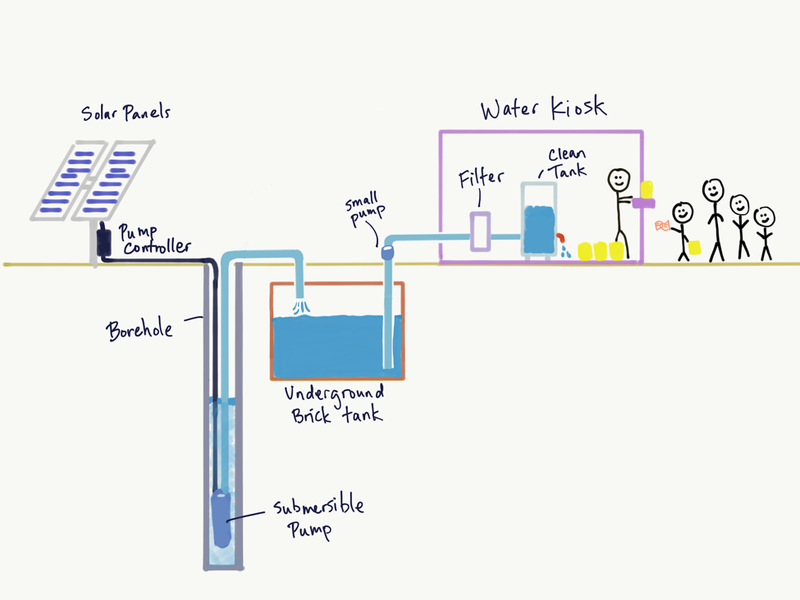 From there we'll filter the water, bottle it, and sell the water for a low cost at a kiosk.